Using a body scrub is something everyone should indulge in once or twice a week. Not only does it make your skin silky smooth and refreshed, a natural scrub is actually beneficial to your skin's health. In order for any moisturizers or other products to work properly on our skin we have to gently clean away all the dead skin cells, dirt and other impurities. This enables nutrients to go deep into the skin, truly benefiting it's health and in turn giving it a smooth appearance and feel. Not only do scrubs clean but they also increase circulation to the skin's surface which is important for your skin to rebuild itself and stay strong and healthy. Exfoliating your skin increases the production of collagen which makes your skin strong and builds elasticity. Which natural ingredients make a good scrub? 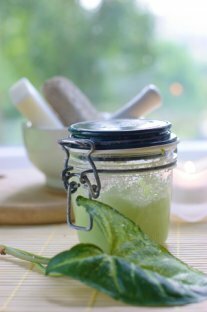 There are usually three main ingredients you will use in your scrub. Below outlines what some of the common ingredients are and how they are used. This is the ingredient that will exfoliate and remove dead skin and dirt. Most commonly used ingredients are sugar, salt, ground nut shells, berry seeds and rice bran. Sugar scrubs are the most gentle and the least expensive. If using a salt scrub it will sting if you have any cuts or open sores so that is something to take into consideration. Of course you can get more exotic abrasives like jojoba beads and others if you purchase it through a company that sells natural ingredients for making your own skin care. Which ever you choose always be gentle on your skin. Always use your scrub in small circular motions, being careful not to scrub too hard. Every scrub of course needs a moisturizer. Essential oils and butters can aid in cleansing and moisturizing. Good choices are olive oil, almond oil, coconut oil and grape seed oil. Shea, coconut and mango butter make a luxurious scrub that leaves your skin beautifully smooth. Choose a natural moisturizer that is suited to your skin type. This one of course is optional, but a favorite scent always enhances any skin treatment. Pick a scent that is appealing and relaxing to you. There are many botanical fruits, flowers and oils to choose from. Orange peel and lemon zest are refreshing and excellent for your skin. Aromatic essential oils like rosemary or lemongrass oil are also a nice choice. Experiment with different scents until you come up with something you like. If you feel like really indulging yourself try adding a bit of yogurt or cosmetic clay to your scrub. You will be amazed at how your skin feels after. When using a scrub always use small circular motions and be gentle. You don't want to damage your skin you just want to gently cleanse it. Paying special attention to elbows and feet will remove rough skin leaving them soft and smooth . Do not use a scrub more than twice a week or you will end up damaging and drying your skin. As you can see natural body scrubs are simple and easy to prepare and are very inexpensive. Spoil yourself tonight with a luxurious natural scrub!